am i right that you can't set up an email alert based on a search from the audi website? also just checking, what are the reg dates for the Plus in the old shape? 2012-2014? No, I don't think so. I was just having a browse last night ahead of a service, seeing what my dealer had in stock, courtesy car bingo and anything special to look out for etc ahead of a service today. I then wandered onto S4s and R8s! Looked at several V10 Plus over the last month. Can't believe how many cars have sports seats rather than the buckets. It was standard with the buckets wasn't it? Came close to a few especially Stratstone's car which drove very well. But did a deal on the R8 at McLaren Ascot - Silver, S Tronic, Bucket seats and 18k miles. It's in beautiful condition for it's age, little or no chipping, perfect paint elsewhere and comprehensive history. Only the ravaged wheels let it down and they are being sorted this week. S14 wrote: Hi all after selling my C63 hunt is on for another car. 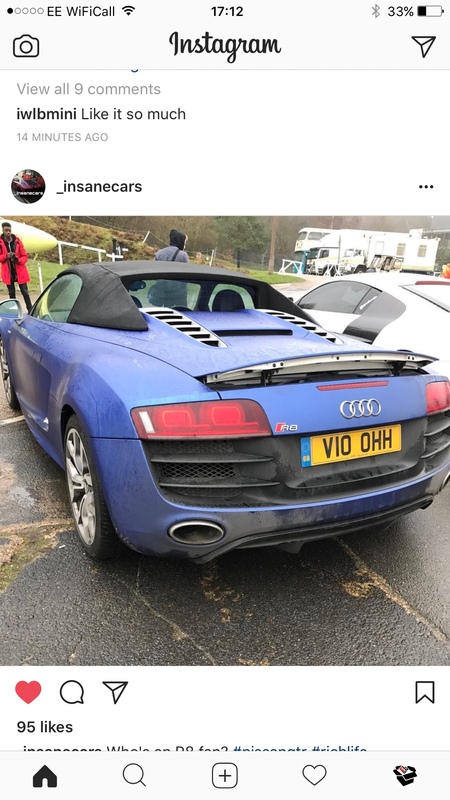 Looking to spend circa 70 k. Poss looking at the v10 plus coupe around 62 plate. Seen a few at 75-80 k. Where do people think these will be in 2 years? Low 60's? this is manual ibis with a wrap obvs interested ? G was after a manual plus. doodlebug wrote: G was after a manual plus.